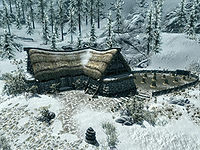 Hollyfrost Farm is a large farm with a single-roomed L-shaped farmhouse east of Windhelm. The farm is owned by Torsten Cruel-Sea, but Tulvur, who lives on the farm, does most of the work. 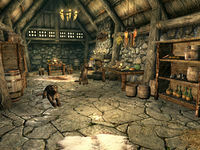 Tulvur and his two dogs, Tiber and Ysgramor, live in the spacious L-shaped house on the property. Tulvur has little need of the novice lock that secures the house while he is away since his dogs watch the premises and attack any intruders. In the field behind the house are used to cultivate eleven bushels of wheat and ten snowberry bushes. At the rear of the property is a grindstone and a wood chopping block. A chicken coop shelters the farm's two chickens while the three goats wander at will around the farm. There are several blue mountain flowers as you approach the farm. At the northern end of the farmhouse is a long wooden table with benches either side and a couple of barrels containing foodstuffs against the north wall. On the table are two bottles of alto wine, a bottle of wine, a couple of loaves of bread and a sliced goat cheese. Opposite the entrance on the east wall is a fireplace with a cooking pot in front and on the mantelpiece are three loose septims. To the left of the fireplace is a barrel with a goat cheese wheel on top and to the right is a kettle containing four potatoes and a long wooden table and bench. This table holds a couple more potatoes, a bulb of garlic, three seared slaughterfish, a leek, a cabbage, a loaf of bread and a sliced eidar cheese. Under the table are two chicken's eggs and a pine thrush egg, while hanging from racks over the table are two rabbits and two pheasants along with two garlic braids, two bunches of dried elves ear and a bunch of dried frost mirriam. To the right of the table is a set of shelves holding two bottles of alto wine, three bottles of wine and copies of Killing - Before You're Killed and Nords Arise!. Coming out from the south wall is a single unowned bed used by Tulvur. Further along the south wall is a chair, a food barrel and a tall wardrobe containing clothes. At the western end of the room is a large double bed coming out from the west wall with an end table on either side, the one to the left has a medium coin purse hidden on the floor behind it and a copy of Scourge of the Gray Quarter and a potion of haggling on top and the one to the right holds four loose septims. At the foot of the bed is an unlocked chest. Along the north wall are a couple more barrels of foodstuffs and a small round table and two chairs with two bottles of Nord mead on top of the table. Finally on the right as you enter, against the west wall is a cupboard and yet another barrel of food. The cupboard only holds clutter, but on top there is a salt pile and bowl of troll fat. In front of this farmhouse is a possible location for the three revelers. This page was last modified on 24 March 2017, at 05:32.